Joseph had waited patiently for Mary to be his in every sense. The contract was signed and that meant marriage in Jesus’ day. To break it, there would need to be a divorce. He was preparing for his bride. Building the marriage room and probably working overtime to get it done. After all, he and his friends could not go to collect her until the preparations were complete. She and her maids were waiting to hear the shout that Joseph had arrived. Instead she heard Gabriel. And, life for this couple was never the same. Death loomed for Mary for you see adultery brought with it a death sentence. We are not told how far along in her pregnancy Mary was when she told her betrothed. She could have hid it easily. We know she was at least three months because after Gabriel appeared she immediately went to visit with her relative Elizabeth. How did she tell him? How do you tell someone something so amazing and unbelievable? Joseph must have been in despair – heartbroken. What had his sweet Mary done? What was he to do? He loved her that was obvious. He wanted to break their engagement quietly so she wouldn’t be disgraced publicly. Good luck with that Joseph. Don’t forget how life in a small town works. As I read Joseph’s story in Matthew, I just love that guy. My heart hurts for him and his broken heart and melts for him because of the tender, compassionate man he was. He was an average Joe chosen by God to do the hard thing. God knew Joseph well. We don’t hear about Joseph after Jesus’ twelfth birthday. We don’t get a lot of information about what kind of dad he was. The little bit we know tells us he was a kind, faithful carpenter who was given the opportunity to be a part of an event every devout Jew eagerly anticipated. The birth of the Messiah. How he must have gazed in the eyes of Jesus in wonder. At last God’s promises had been fulfilled and before him was the Child. What a beautiful perspective on this old, familiar story. This year I keep being nudged to see things from Joseph’s perspective, which I think is very interesting. He played a quiet, supporting role and was given the chance to partake in a miracle. What a blessing! I hope you had a blessed Christmas and a happy New Year! Hello Jenni :) Our Christmas was indeed blessed. Hope yours was too. I really wanted to honor Joseph this year. He was so important to this blessed event yet he seems to get lost in the story. I like when us average folks get used by God. Don’t you? Oh Carmen, I LOVE this! What a great post, my friend!!! (And I am in love with that graphic!) Merry Christmas! Thank you Karrilee! I’m so glad you made a Christmas Eve visit. Merry Christmas to you as well! Our lives are a vapor. We never know the full weight of our tasks set before us. Aside from the Bible account, Joseph and Mary would have been the forgotten pieces of the Jesus puzzle. The were greatly used in their time on earth, but they were God’s means to an end. Whatever the tasks lays before me, faithful obedience to Him is the important thing. He is worthy. If I focus on the task (and some can be daunting, puzzling, or just plain GROSS) I will miss the apex of all God made me to do. Welcome Christy! It is so good to have you visit. You gave me something to think about in your comment. “They were greatly used in their time on earth but, they were God’s means to an end.” God chose to use us to do His great work on earth. Joseph and Mary were used mightily, had a deep relationship with God’s only Son, impacted all of our lives and then left this world as we all will. Like Jesus said, He came to do His Father’s will. I’m with you Christy, Lord, don’t let me miss out on what You birthed me for. Merry Christmas! What an impactful perspective, Carmen! I won’t soon forget your “average joe” reference. Such a beautiful post. Merry Christmas to you and yours. I am humbled by your kindness. Thank you for visiting and I hope to see you again soon! Merry Christmas! I love the hope in this story that God uses everyday, ordinary people – like Mary and Joseph – to do extraordinary things. We just have to be faithful to listen and obey. Love this post today! Merry Christmas! Hey Kathryn, I am so glad God uses regular ole folks like me. He reaches out even when I feel like I have nothing special to offer. Thanks for visiting today. Merry Christmas! Tania, I so wanted to convey my feelings about dear Joseph. I’m glad you felt them in my writing. Come visit again soon! Merry Christmas! Carmen, what a blessing this was to read. You entered Joseph’s world and allowed us a peek there too. I love his unquestioning obedience. Thank you for linking this verse up. Merry Christmas from your neighbor at #RaRalinkup. Ahh Ruth, you are a blessing. God allowed me to see Joseph in a new light myself this year. Love that guy. God indeed used him in a mighty way. May your 2015 be filled with blessings and favor from God. Merry Christmas! Carmen, I love the idea of “an average Joe.” Thank you for inspiring me to think of this in a new and fresh way. What a beautiful story you highlight. You illuminate this story in beautiful ways and I am blessed as a result. Cheering! Cheering! Go Carmen. God smiles at how you glorify him. Rah! Rah! Much love sister. Love you Kelly! This “average Jane” is sure glad God loves using just average! Merry Christmas! I love this, Carmen. 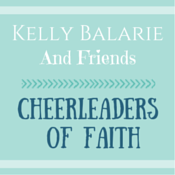 Thank you for sharing it here…what a great encouragement, something we can all relate to. He chooses those who are willing to trust His plan. And beautiful photo! Blessings to you! Thank you so much for visiting Angela and for your kind words. Blessings right back at you. Merry Christmas! “God uses average Joes in astonishing ways.” That one sentence overflows with hope. I love it! (And your graphic too.) Merry Christmas! Hey Kristi! It does give us hope to know we can be used as well. Thank you friend! Merry Christmas! Such a beautiful and inspiring post. Joseph had to have been compassionate and kind, and full mercy. Thank you for allowing me to think upon Joseph as I haven’t before. Merry Christmas! Barbie I certainly look at Joseph in a different way too. Thank you for your kind words and for stopping by. Merry Christmas! Powerful post! I just read the second chapter of The Jesus I Never Knew describing the birth. We are never really taught to look at Joseph and what he experienced. Love your thoughts on this. Also reminds me of the scene in the movie, Nativity Story. The way the actor playing Joseph looked at Mary after giving birth to Christ was so endearing – just as your words described here. Visiting from The Brew! Dad’s of newborns sometimes get left out don’t they Carrie. God was so good to help me think about Joseph in a new way. I can only imagine how he felt after Jesus’ birth. He must have been in awe. Thanks for stopping by. Come again soon. Merry Christmas! Beautiful, Carmen, just beautiful! It brought rears to my eyes thinking of Joseph’s wonder and awe! Awww, thanks so much Ellen. I am so glad you came by for a visit. Joseph was a wonderful guy indeed. Merry Christmas friend! Thank you Sharon for sweet words of encouragement. We don’t hear a lot about Joseph. He must have been such a kind man. We both saw him in a new way yesterday. Thank you for visiting. Merry Christmas! I saw Julie’s tweet and came right over. I hope God uses average “Janes” like us too! I’m so thankful that God uses the ordinary to accomplish his extraordinary purposes. Have a great weekend, friend! Me too Betsy! Cause, I’m a average Jane. Merry Christmas friend! Carmen, I love this post. I’ll be sharing it today. What a blessing to follow you at The Weekend Brew. I especially was drawn to your image. 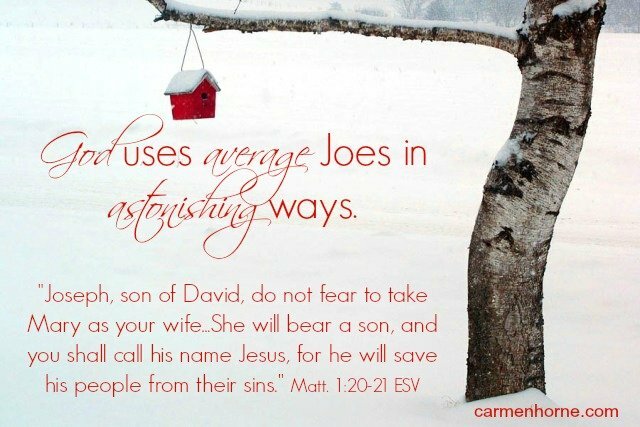 “God uses average Joes in astonishing ways.” Amen! God bless you, sweet friend! Thank you my dear friend. You touched my heart. I am humbled that you would share. May you have a very Merry Christmas!